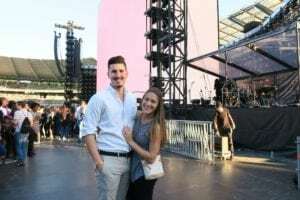 Thanks to a connection with the pop queen’s tour manager, we made a special trip to Brussels so that we could make a MONQ delivery to the crew–in person! Before you ask: Yes, it was amazing. Getting to see behind the scenes of a production as huge as Beyoncé’s Formation World Tour was simply fascinating. 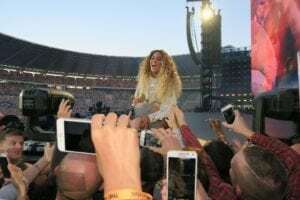 Beyoncé and her crew travel the globe to put on shows that draw thousands and thousands of people, yet under the stage and behind the fences, things were pretty much just…chill. Her dancers were sweet and eager to chat. Her band girls were friendly and personable. The entire crew was kind, welcoming, and down-to-earth–as if it ain’t no thang that they all come together to produce a spectacle that millions of people spend years dreaming to see! 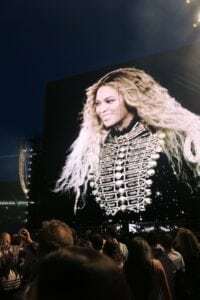 I’ll share more when I find out how much I’m allowed to share, but for now, enjoy these pictures from the VIP section (Beyoncé’s “Beyhive”) of the Formation World Tour in Brussels, Belgium. And check out Facebook for my live feed from the concert! Comin’ at you from the Beyhive. Officially paying for VIP tickets to all concerts from this point forward. 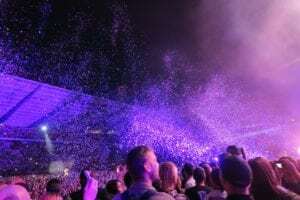 Concerts in the twenty-first century. Creepy or cool? Still deciding. Talk about a grand finale!